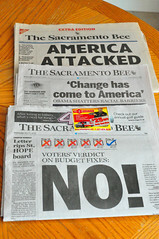 I have no particular grudge against the Sacramento Bee. They've been known to print my crazy rants in the letters page from time to time, and I graced the pages of the Scene section not too long ago. They mostly deliver the paper to the door when I ask, and sometimes even manage to stop delivery properly when I go on vacation. Sure, they're no San Francisco Chronicle or Los Angeles Times or Albuquerque Journal but they try. And maybe their website has been called "the worst attempt to create an online version of a newspaper [we] found", but you can't hold that against them. All in all they do the best they can for a small town paper. Now, that said, I opened up the front door today to find a monstrosity on my doorstep. If I can be blunt (and I can), this may be the biggest typographical mess I've ever seen grace the pages of this paper. To briefly catch you up to speed in case, like the rest of the state, you failed to vote or even care in any way about yesterday's election: there was an election that nobody seemed to care about. Pictured here is today's paper compared to the issue from November 5th after the landslide election of the nation's first black President, and September 12th after the worst terrorist attacks in US history. Which of these events will you remember a year from now? 5 years? 50 years? Which one most deserves the gravitas of a gigantic headline? Just to put this in perspective a little more, today's headline font is an astounding 4 inches tall which makes it roughly a 288-point font. When was the last time you used 288 point font for anything? More to the point, when was the last time a respected newspaper used 288-point font for anything? I'll answer that: probably never. In fact, the largest headline that the New York Times, perhaps the most respected newspaper in the country, has ever printed used a 96-point font. And that size has only been used less than a half dozen times. Total. The NYT knows that their headline is their most valuable asset. It's the first thing people see when they pick up the paper. Abusing it by turning it into the print equivalent of the <blink> tag is not an option. I'm a long time Bee subscriber, and I probably won't cancel in the immediate future (mostly by the power of inertia — it auto-renews on my credit card and I'm too lazy to pick up the phone and talk to someone in order to change that. Plus I really like getting the Best Buy ad on Sunday) but seriously Bee, what the hell? Today's front page was a mess. We're all aware that printed news is on the way out, only luddites and (surprisingly) the Japanese still read print papers, but if you want to turn off what little readership you may have left, then congratulations on a job well done.